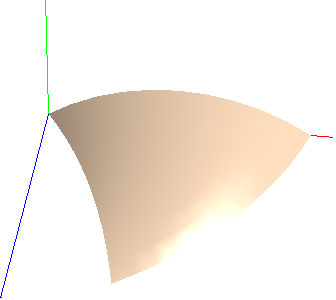 The simplest surface in DI models is a 3DS patch. A 3DS patch is a piece of surface between two 3D Curved Segments and flat edges at top and bottom cross-section planes. Fig 1. A 3DS patch with one straight (right) and one curved (left) edge. Fig2. The same patch in wire frame. A patch has distinct orientation. Figure 2 shows names of each of four edges in a patch. Left and right edges are considered more important. 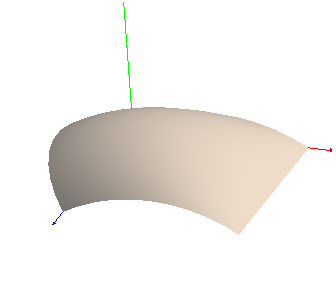 They are 3D Curved Segments. Unless we point out specifically, by edges of a patch we normally mean left and right edges. Edges can merge at any point or even coincide at whole length. Surface of a patch in projection to z-axis is contained exactly between two sequential base knots. This is the consequence of the fact that both (left and right ) edges of the patch have ends with z coinciding with two sequential knots. In the model from Figure 2 if the second base knot is modified whole patch will appear expanded or contracted along z-axis. Another assumption about patches in 3DO is that in each cross-section patch is an arc or straight line. Fig 3. Patch and its cross-section at the middle z-position. 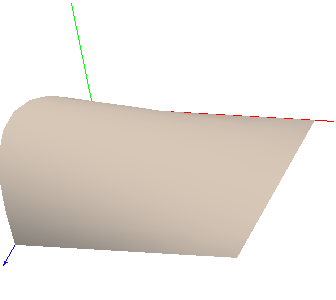 Modification of curvature if cross-sectional arc (using Cross-section Editor of 3D Debugger or programmatically) leads to changes of internal curvature of the surface patch. There two distinct types of patches: general arc patch similar to one in Fig 1-3 and linear patch. Cross-line patch is a patch which in any cross-section is a straight line. Cross-line patch sometimes not quite correctly is referred to as a flat patch. In 3D Debugger type of patch can be changed dynamically by using "Change Class" command of the Cross-section View. Programmatically it can be achieved using SetType method of IStripTopol interface. When an arc patch is converted to Cross-line patch its curvature changed to zero at every cross--section but edges remain unchanged. 3DS Patches are special kinds of Generic Patches. Arc patch has a single parameter, which determines how curved the patch is. By default this is curvature. This can be changed to make it radius. Arc patches which have radius as its parameter are called Radial Patches. Because radius and curvature are inverse of each other, a radial patch with constant parameter equal to r is geometrically the same as standard Arc Patch with curvature 1/r. Despite that, normally Radial and standard arc patches are different in shape. For example Radial Arc patch with radius equal 0 at one knot and 1 at another can not geometrically coincide with any standard arc patch. Radial patches have restriction that the radius can not change its sign at whole length of z range. Because of that, standard arc patches are easier to modify but Radial Patches are more intuitive in many cases, when modeling standard shapes like cones or spheres. All patches in a Patch Strip currently must have the same type. Type of an arc patch can be changed dynamically by using "Element type" controls on the Current Object page of Modeling Studio or in Properties dialog (Context menu in Cross-section editor).